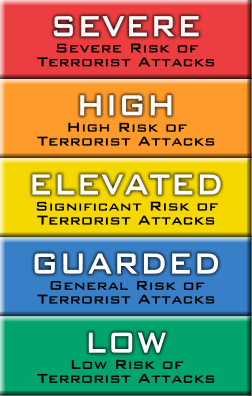 I love the simplicity of the Homeland Security colour-coded advisory system. Green – Relax! Take a load off. No worries here. Blue – Start getting a little anxious. Yellow – Be afraid. Be very afraid. Orange – Begin making your final arrangements. Red – Stop reading this – you’re most likely dead already. This list could be simplified to the last three colors (yellow, orange and red), because it is doubtful the U.S. government will ever set the level to Green or Blue. This helps keep everyone in a general state of panic. Green – This document is 100% complete and accurate. And it’s also fun to read! Blue – Unless this document is describing something that could hurt or maim you, you can safely refer to it. Yellow – This document contains quite a few errors and omissions that we just couldn’t bother fixing. Sorry about that. Proceed with caution. Orange – Oh boy – this document has alot of problems. Missing procedures and overviews. Tasks that you can’t complete. A rotten index. I would stay away if I were you. Red – Don’t even bother reading this. Ask your tech friend for help. As an example, this entire blog could be classified as bluish-green.